A bounce rate is essentially a single-page session. This means a user performs a search, clicks one of the search results to visit a web page, and then closes the browser or clicks away without performing another search or visiting any of the page’s connected pages. How to Calculate the Bounce rate? How Does Bounce Rate Function in Google Analytics? How to Interpreting and Improving Your Bounce Rate? How to Audit Your Bounce Rate? Modern search engine optimization (SEO) is a constantly shifting environment. There is a balancing act between web page developers trying to rank as highly as possible in search rankings and search engines like Google constantly developing new tools and tweaking their algorithms to create as level a playing field as possible. Successful SEO hinges on taking advantage of the metrics search engines use to rank search results so your web page appears in as many relevant searches as possible. Google’s search engine algorithm uses various metrics to refine search results, and judges user behavior to determine search result quality and rankings. One such metric is bounce rate, or the rate at which users “bounce” off of a search result page without sending another query to the Google Analytics server. 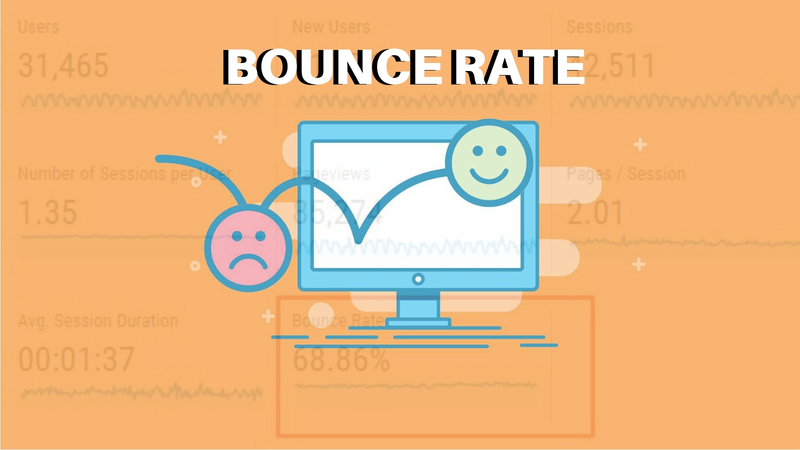 The simple formula for calculating bounce rate is dividing the number of single-page sessions or bounces by the number of all sessions. If users click search results to your website and then click away from more often than they perform subsequent Analytics queries or visit your other pages, your page will likely develop a high bounce rate. It’s important to note that the Analytics server does not track the time you spend on a page, so the tracked time for a bounce or single-page session is functionally zero. The Analytics server would only be able to gauge the time spent on a page if you click back to the search engine or perform another action that queried the Analytics server. Google Analytics considers a user to have “interacted” with your site if they click on more of your content or check additional pages other than the search result page. Have you any idea what ideal bounce rate is? SEO professionals have struggled consistently over recent years to adapt to changing algorithm preferences and performance metrics. A few recent Google algorithm updates launched to essentially punish sites with low-quality content or sites with unnatural or broken link histories. Google is constantly altering the ways their algorithm works, and you may wonder what the ideal bounce rate is for your site. The answer depends on the type of site you own. You may think a high bounce rate indicates that users are simply visiting one page and then leaving, which could be a negative result for some pages. This is only bad if your website and your business model hinge on users visiting multiple pages on your site or clicking through different segments of your site. A site that publishes news articles likely wants to encourage users to visit multiple articles on different pages beyond the search result page – so a high bounce rate would be bad. A blog, on the other hand, typically displays most of its content on a single page, so a high bounce rate is expected and perfectly normal. Google Analytics tracks user actions after performing searches, so a bounce technically means a user clicked on a search result and then did nothing else. The user did not click any links on the page to other pages on the site or external links to other sites and did not click the Back button to perform another search or look at other results. The Analytics server doesn’t receive another trigger from the user after the search, so it tracks the interaction as a single-page session. Google does not use Google Analytics data in page rankings, but that doesn’t mean your bounce rate is entirely separate from your ranking. If your site’s success depends on attracting users to your site and staying on your site or performing other functions, such as visiting your other pages, then your bounce rate likely is a factor if ranking suffers. This indicates that the content on your site does not match the experience a user expected when clicking on your site in search results. A high bounce rate isn’t automatically a negative thing, and an aggregated view of the bounce rate across your entire site isn’t enough for you to determine the health of your site’s bounce rate. It’s better to track your bounce rate in segments. If you own an e-commerce site that also has a blog, the bounce rate for the blog portion of your site will likely differ widely from the bounce rate on your e-commerce pages. Sites like blog pages are low-intent pages driven by organic traffic, social media linking, and email marketing. The goal of low-intent pages like blogs is to attract users to a page and digest that page’s content, such as a long blog post or series of posts. Pricing pages are generally high-intent pages driven by direct traffic from search engines and referral links on other pages of your site. These pages strive to convince users to perform specific actions, such as clicking on a video or clicking a downloadable attachment. Low-intent pages may have high bounce rates but still, lead to conversions. A user who visits a blog site may only do so to read the contents on the landing page before clicking away, but the user returns repeatedly for new content. They may only be single-page sessions, but the user experience you’re offering only exists on a single page anyway. A high bounce rate would not be an indication of negative performance. However, if your landing page is supposed to be driving engagement and encouraging multiple Analytics queries, you need to know a few methods for lowering your bounce rate. If your site’s goal is to simply attract users to the page, then they likely won’t be performing any further actions beyond investigating the result page. If your high-intent pages are showing a high bounce rate, then you need to reexamine your approach to these pages. From a holistic SEO standpoint, this could mean altering your content, restructuring the linking on your site’s pages, or transforming your marketing approach to encourage more user engagement. If you have a single-page website like a scrolling blog, then you should expect a 100% bounce rate and there is no real reason to attempt to lower it. There are several techniques for lowering your bounce rate, but the best methods will vary for each individual website. If users are visiting one of your landing pages after searching for relevant keywords but clicking away, then it’s likely that the experience your search result landing page provided didn’t meet the user’s expectations. You can adjust your bounce rate by calculating the time users spend on a page or use the Google Tag Manager for further customization and segmentation. You can set different “events” in your Google Analytics tool so it will track single-page sessions appropriately. if the goal of a particular website is just to play a video for a user, then watching that video should count as a zero percent bounce rate. You can make almost any event an “interaction” in your Google Analytics dashboard so you can more accurately assess your pages’ performance. Bounce rate generally only influences the profitable pages on your site, so creating a profit index is a good way to track the aspects of your high-intent profitable pages. Your profit index should include the pages that lead to the most successful conversions or transactions. Without a profit index, you may wind up wasting time and resources improving essentially inconsequential pages that have no real bearing on your conversion rate or the number of successful transactions resulting from searches. By using a profit index to improve the bounce rate on your profit-driven pages, you are essentially ensuring that the optimization efforts you conduct will impact your bottom line. Google Analytics allows you to sort your profit index table so you can determine which parts of your site are the most successful and which ones need improvement. If a landing page seems to lead to conversions more than your blog pages, you may need to enhance the quality of your blog posts. Google Analytics will quickly point out which areas of your site are struggling with higher-than-desirable bounce rates. You may need to adjust your keyword strategy or linking habits and stop attempting to draw traffic from low-value channels. You may also need to develop better landing pages that meet users’ expectations when clicking on them from search results. Landing pages should also have clear calls to action that encourage a visitor to take a specific action, such as signing up for your newsletter, downloading a freebie, or making a purchase. Calls to action need to be relevant to the content of their landing pages for better user experiences. It’s also important to avoid judging different areas of your website on the same standards. Your overall bounce rate may seem high, but when you break it down and track the various areas of your site, you may find that only a few areas are leading to more bounces than others. A few adjustments in these areas can help bring the overall bounce rate down, so segmented bounce rate tracking provides more accurate insight into the things you can do to improve. You can segment your bounce rate tracking by date, page, or combinations of different metrics. You can also check to see how your bounce rate fluctuates based on traffic channels. The landing pages linked from social media posts may report high bounce rates, indicating that users’ experiences on those pages are not consistent with the expectations built from reading your social media posts. If you notice a lower bounce rate after producing a particular type of content, then this could be a sign that your audience prefers that type of content and is more likely to further engage your website after consuming that type of content. Many digital marketers mistakenly assume that a single-page session is an inherently bad thing; therefore a high bounce rate is an indicator of poor performance. This is not necessarily true for every web page. If a user is trying to find out show times at a local movie theater, he or she may click through several pages on the theater’s site trying to find the listing. The site reports a zero percent bounce rate since the user made multiple interactions with the site, but the user likely didn’t have a positive experience, since finding relatively basic information took a long time, and the results on the landing page didn’t match the user’s expectations when performing the search. A user may find another theater’s website that has that day’s showtimes listed prominently on the landing page from the search results. This page may show a 100% bounce rate even though users are having positive experiences and getting the exact information they need more quickly. You need to consider the intent of a web page, your conversion rate, and many other aspects of your site’s performance to determine if your bounce rate is too high. It is worth noting that there are some universal benefits of a low bounce rate. Lower bounce rates, even on pages that don’t intend to drive additional interactions, show more engagement on your site. Your blog’s bounce rate may not matter much to you, but if readers of your blog are clicking on other links on your site after reading your posts, then your blog is a valuable asset for building user engagement and creating better experiences. Bounce rate is a commonly misunderstood metric that has different implications for different websites. Before you can determine whether or not your bounce rate is in a good or bad state, you need to determine the best method for tracking bounce rate across the different areas of your site, which events matter as “interactions” on those pages, and the ultimate goal for each page on your site. The bounce rate on one area of your site may be directly influencing your conversion rate or profitability, while the bounce rate on lower-intent pages essentially doesn’t matter at all. It’s up to you to determine which parts of your site should be driving interactions and then adjusting your marketing strategy or web page design accordingly.